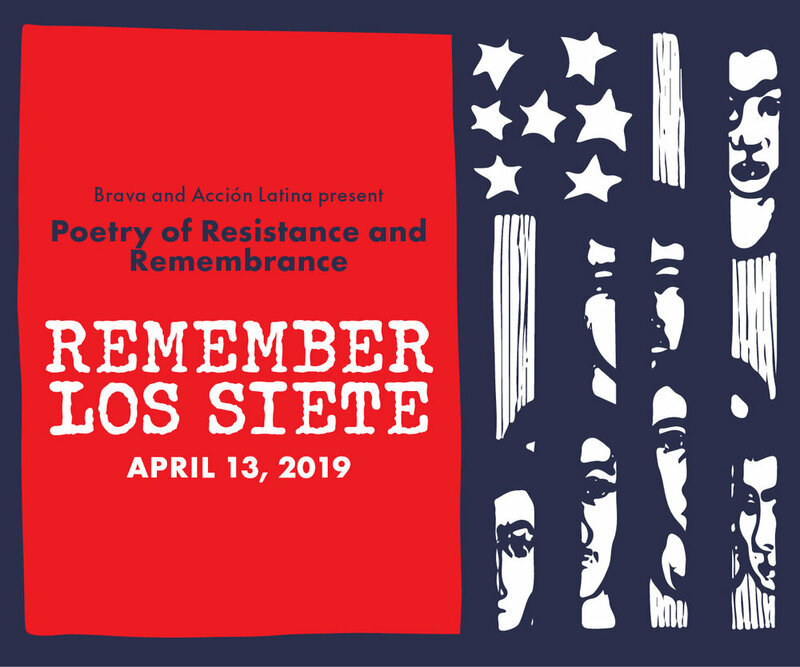 Please join Brava and Acción Latina for Poetry of Resistance and Remembrance, a free event featuring readings by original Los Siete de la Raza organization members and joined by younger generations to remember resisting injustice 50 years ago and continuing the fight to live free today. DJ Leydis will also be in the house spinning, and Brava’s Cabaret bar will be open. This FREE community event is just one in a series of events commemorating 50 years of resistance from Los Siete until today. The full schedule of Remember Los Siete community events can be found here. Josiah Luis Alderete is a full blooded Pocho Spanglish speaking poet from La Area Bahia who learned to write poetry in the kitchen of his Mama’s Mexican restaurant. He was a founding member of San Francisco’s outspoken word troupe The Molotov Mouths. He is also a radio insurgente whose stories have appeared on KALW’s “Crosscurrents” and whose show “The Spanglish Power Hour” aired on KPFA. He curates and hosts the Latinx reading series SPEAKING AXOLOTL in Oakland which happens every third Thursday of the month at Nomadic Press Studios. Donna James Amador, Educator, SFSU Strike Veteran, Los Siete de la Raza Member, Long time Mission Activist, Abuela, Elder, Truth Seeker, Peace Lover, Hermana. Cathy Arellano’sI LOVE MY WOMEN, SOMETIMES THEY LOVE ME is for anyone who has loved, been loved, or been left. Arellano’s SALVATION ON MISSION STREET, poems and stories set in San Francisco from the 1960s to the 2000s, won the 2017 Golden Crown Literary Society’s Debut Author Award. Maya Chinchilla author of “The Cha Cha Files: A Chapina Poética,” is a Guatemalan poet, non-fiction writer and educator who gives readings, lectures, writing workshops and has taught at UC Berkeley, UC Santa Cruz, and San Francisco State University in Chicana/Latino/a/x Studies, Media Studies and Creative Writing. She is the editor of the forthcoming “CentroMariconadas” inspired by Dr. Horacio Roque Ramirez, an anthology of queer and trans Central American writing. Maya received her MFA in English and Creative Writing from Mills College, a BA in Latin American and Latino Studies at UC Santa Cruz. Maya writes and performs poetry that explores themes of historical memory, heartbreak, tenderness, sexuality, and alternative futures. Her work —sassy, witty, performative, and self-aware— draws on a tradition of truth-telling and poking fun at the wounds we carry. For more info mayachapina.com. Judy Zalazar Drummond worked with Los Siete de la Raza, wrote teacher guides for "500 Years of Chicano History" and “The Fight in the Fields,” and taught school for 50 years. She is on the Mental Health Board of San Francisco and has a show on KPOO 89.5 fm, "Connecting the Dots." Originally from San Francisco, Tongo Eisen-Martinis a poet, movement worker and educator. His book titled, “Someone’s Dead Already” was nominated for a California Book Award. His latest book “Heaven Is All Goodbyes” was published by the City Lights Pocket Poets series, was shortlisted for the Griffin Poetry Prize and won a California Book Award and an American Book Award. Prado Gomez is Mission District born and raised. He is a proud staff member of the Shanti Project as Facilities and Pet Food Bank Director at their Mission Campus. He is sometimes a writer and always a singer of various genres of music including Rancheras, gospel, classical and R&B. Leticia Hernández Linares is a poet, interdisciplinary artist, and educator. She is the author of Mucha Muchacha, Too Much Girl (Tía Chucha, 2015). Widely published, she has presented her poemsongs throughout the country and El Salvador. She teaches in the College of Ethnic Studies at San Francisco State University. Visit her: joinleticia.com. Maria E. Ramirez is a woman of Chicana, Puerto Rican and Apache ancestry. Her activism began in the late 60’s by supporting the farm workers struggle and the fight to open up the colleges and universities to historically marginalized students. She went from Chabot College, where she was a founding member of the Chicano Student Union, transferring to UC Berkeley as a beneficiary of the Third World Strike for Ethnic Studies there. She became part of an Anti-War, all woman Teatro group, performing at the Indochinese Peace Conference in Vancouver, Canada . She left Berkeley to join the Los Siete Organization and has maintained her deep friendships with her comadres for the last 50 years. She has continued to use the arts, and Teatro developing her own one woman storytelling performance, taking it all over the world, most recently to Toronto, Canada for the World Indigenous People Conference on Education. Joe Navarrois an educator and poet whose writing is inspired by people’s struggles for human dignity, peace, equality and social justice. Originally from San Francisco, Joe has also lived in Oakland, Denver, Hollister and Hayward, where he participated in community, labor, peace, immigrant rights and education rights organizations. S.F. City Girl, Dancer and Media Artist, Andrea “Budafly” Rodriguez flutters through this world with style and grace. A cultural bearer of the arts, movement and imagery catch her on the streets or stages sharing gifts and blending her worlds where red wine and dark chocolate intersect. Roberto Ariel Vargas, MPH works for health justice, locally and nationally. Ariel grew up influenced by heavyweight poets he considers family. Publications include Cipactli anthology of San Francisco State’s La Raza Studies Department. Ariel was conceived at the height of his parents’ involvement in organizing for Los Siete de La Raza. Norman Zelaya was born and raised in San Francisco, CA. He has published stories in ZYZZYVA, NY Tyrant, 14 Hills, Cipactli, Apogee Journal, among others, and he was a 2015 Zoetrope: All-Story finalist. He is a founding member of Los Delicados, and has performed extensively throughout the US with them. Zelaya has appeared on stage, in film and in the squared circle as luchador, Super Pulga. In 2017, he published his first book Orlando & Other Stories. Currently, he is working on new material for his second book, a novel. He lives and works in the Mission District, SF.